For the Pakistani-led cover look, we called in beauty supremeo Symah Khan. Creative and innovative, we knew she alone could create a look that’s authentic yet editorial. Taking inspiration from the rich colours of the outfit, she began by enhancing our model’s features with bronzer and contour before sealing lips with a warm rust hue. Eyes were left simple, with deep nudes, metallics and the faintest smudge of kohl. Walking into O’nitaa’s flagship store in Marylebone is like stumbling across a portal to an Aladdin’s Cave filled with Asian designers. 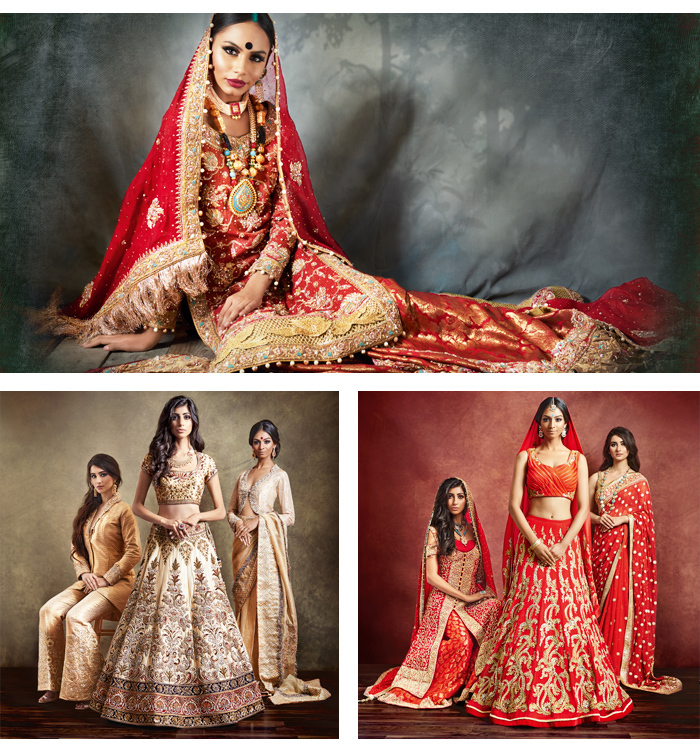 The stunning concept boutique is filled with a range of elite brands, exquisite couture and some of the very best Indian and Pakistani bridalwear to be found in the capital. 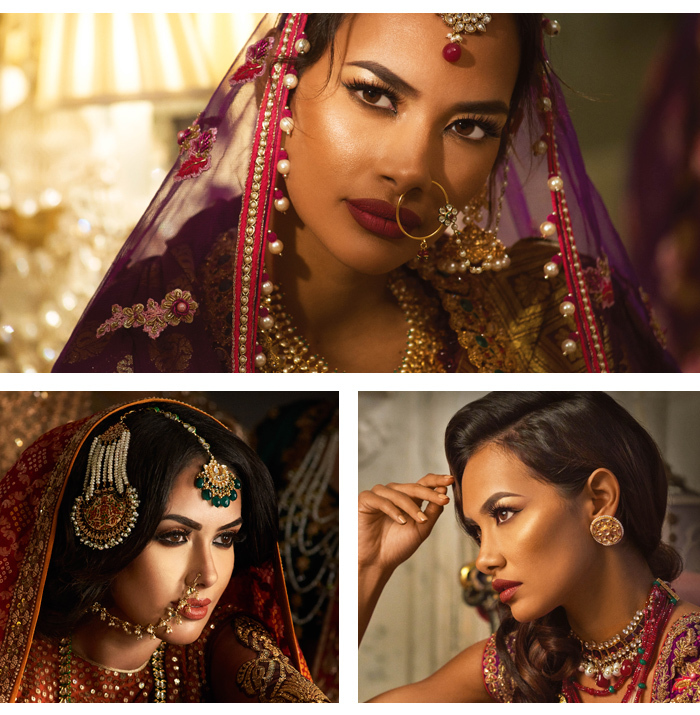 For our Pakistani-inspired cover, the Khush Creative team decided on a traditional bridal look; a Sharara, a pair of voluminous pleated trousers worn with a decorated kameez and dupatta. Created by acclaimed Pakistani designer Rana Noman, our cover outfit is a fresh, modern take on a timeless classic. We adore the sheen on the bronze trousers, highlighted by the azure blue of the dupatta border. Our cover jewellery was about complementing the majesty of the outfit. 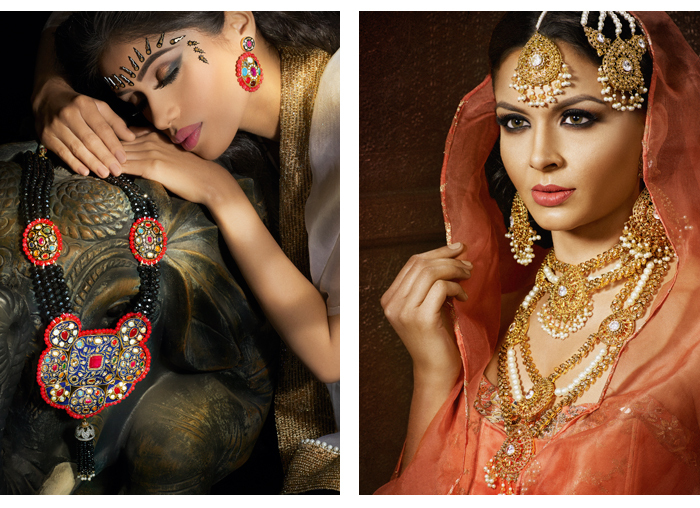 Jeweller Anees Malik creates alluring ornaments, so who else would we call for the finishing touches? Layering is a styling trend that shows no sign of slowing, which is why we’ve opted for a muti-layered bridal jewellery look. A nose stud with chain completes the look.